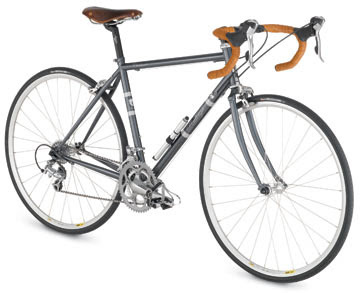 I personally have been drawn to this bike because of its connection to the Raleigh roots -- the steel road bike. The merge of Reynolds 520 butted cro-moly tubing with a Brooks Swift Saddle is a trip back in time that Marty McFly and Doc Brown would be able to truly appreciate. The reviews I have read have been great so far (dirt rag blog review) with many people seeing this as a great commuter bike, let alone a really good foul weather training bike. I currently have a Clubman in my sample stock and it rides extremely well. The bike has very predictable handling with a very neutral positioning. It tips the scales in the low 24lbs range. The Tiagra components (complete bike) have been performing well, but my surprise has been regarding the Tektro long reach brakes. Normally this is not a big deal, to me at least, but what this has allowed is enough additional clearance to ride with a moderately aggressive 32c cyclocross tire. I exchanged the wheels from a Raleigh RX 1.0 (another great dual purpose bike) and the bike instantly transformed into a four-season commuter. In a cycling world full of amazingly well-riding frame materials, I am a little surprised to once again be singing the praises of Steel, but this bike performs well. Just got one a few weeks ago and after 300 miles I must say I love this bike. It rides smooth and is definitely versatile. I bought this to be my one road bike, although as stated above, with cx tires this thing is just as versatile as a surly cross-check or anything similar. so, that looks a little weird. besides that I love it. I will have it for many years.